This class overides the onRendered method to write out the entire run script from the HTML above. I can now modify my extended WebPage class to add an instance of the ReportComponent class. The script is written below the Label component. Note that you can use the built in view time functions like selecting new parameters and rerunning the report without any additional code. The example files can be downloaded from Birt-Exchange. See this link for more details on what is available in the JSAPI. BIRT Reports can contain Flash components using the Text element. Actuate has also extended the BIRT report designer to include Flash charts. 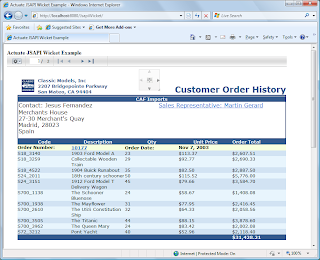 As stated in previous post the JSAPI can be used to include BIRT content in just about any front end. BIRT currently does not support a Flash emitter, but a Flex component can call the JSAPI to include and modify BIRT content within the same HTML page. This post details how this can be achieved. The Flex SDK provides a Flex Ajax bridge that allows a Flex application to call and interact with Ajax based APIs. To illustrate how this can be used with Actuate’s JSAPI, I am going to build a Flex application that list a couple of reports. The application will also contain a button to execute the report. The output for the report will be written to another DIV element within the HTML wrapper. The mxml file is pretty simple and contains a DataGrid that calls an action script to load the names and paths of two reports. <mx:Panel id="pnlMain" x="10" y="10" width="560" height="260"
For brevity, I have foregone error checking and player checks. 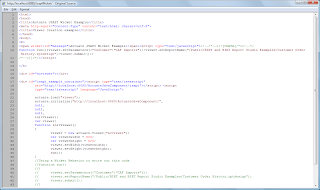 To use the JSAPI the following code is added to the wrapper HTML file. This code is very similar to previous examples with a few notable exceptions. When the JSAPI is initialized the call back function initViewer is set. In addition to a button in the Flex application, the HTML wrapper also contains one to run the report. Not that two buttons are needed, but for illustrative purposes, this example contains two. In this example we disable the button until both the JSAPI and the Flex component are initialized. The Viewer JSAPI component is created as usual and then the setupFlashCallBack() function is called. So the report can be run from either button. The run function sets the report name and executes the API to run the report. 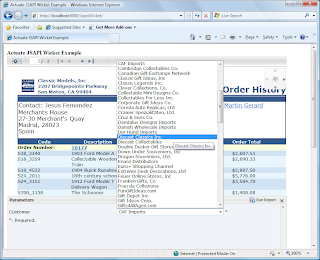 The bridge provides getter and setter methods for the items in the Flex application. The DataGrid contains two columns (name and path). The path contains the location of the report, so this is the field that is retrieved from the Flex application. See the Flex developers guide for more details on the bridge calls. This example can be downloaded at Birt-Exchange.